There are many teachable moments created by The Phillips Collection. 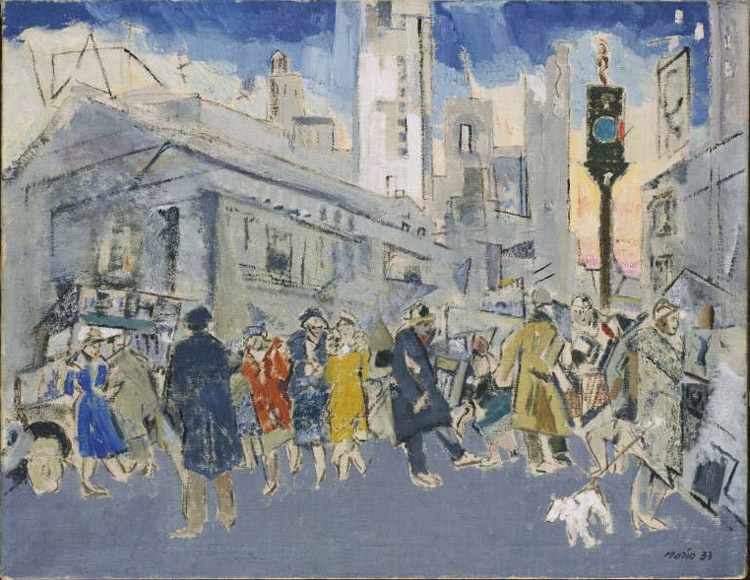 One of my favorite works of art is Pertaining to Fifth Avenue and Forty-Second Street by John Marin. Many of the students we work with live in Washington, DC, so offering up a street scene gives them subject matter to which they can relate. We capitalize on that, asking them to “jump into” the painting and tell us what they would hear, see, feel, and smell. At almost any age, students are anxious to thrust a hand into the air and tell us. There is also the artistic expression to be explored. Marin fearlessly shows us slashing black outlines, blank white canvas, flattened buildings, overlapping geometric shapes and dashed off human forms. We try to get our students to identify Marin’s technical bravado. If we are lucky, we can lead our students to an understanding of the relationship of the artistic technique and the subject matter; how the diagonal line created by the body of the man on center conveys the tottering gait of a drunk, how the straight lines of uneven width impress upon us the energy of the city, that the palette of grays and blues gives the wash of urban grit, and the flattened perspective gives us a sense of how closely the people and buildings are packed. Recently, while at J. Crew, in the middle of a holiday shopping sprint, I turn around and find a large book about John Marin on the sweater table. First I think: “Hey! That is MY John Marin!” What is a book on him doing here, at J. Crew, amidst the sweaters (40% off!)? I rack my brain. As a museum educator, I am trained to find relationships between works of art and…”The Outside World”. There must be a merchandizing department at J. Crew. They must have thought this out. There is a relationship and it is up to me to find it. 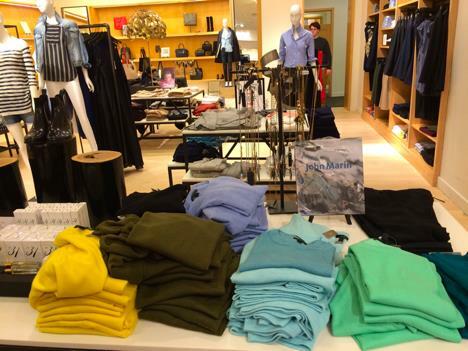 Were the sweaters to be in Marin-esque colors? Actually, they were! Seafoam green, shades of blue, a smattering of grey. Some earth tones such as moss. A slash of unexpected color in the gold. Would that mean that on the table showcasing evening-wear in dark grey, languid chalk color and ebony, I would find a catalogue for Francis Bacon? I am still unsure what the connection was meant to be. And, you know, it is unlikely that the folks at J. Crew intended for me to over-think this. However, I am looking again at Pertaining to Fifth Avenue and Forty-Second Street and now the camel hair coat pops off the canvas, the dog is a Jack Russell, the drunk has been sampling microbrews, the three girls arm-in-arm are in the same dress—wool crepe but different colors; I envision boat shoes on the men and the food truck is selling fish tacos. This entry was posted in Experiment Station and tagged J. Crew, John Marin, popular culture. Bookmark the permalink. It’s interesting to discover artists in the oddest places. The person you seek is probably one or a team of color designers at J. Crew. They are art/design majors when in college and get a whopping dose of art history. Paintings are often a reference for a collection of colors. Sometimes a retrospective of a major artist will impact fashion and furnishings for the next several years. Those of us of a certain age can think back to a major Matisse show which left huge tropical leaves and sun bedazzled colors in its wake for several years.